The words seen above are the words we hear in the opening of this exclusive A64, that Angel Haze uses to describe the undeniable talent of South London based singer - Sasha Keable. Female vocalist of the moment, Sasha Keable, is no stranger to high profile collaborations, having worked with the likes of Disclosure in the past. This time, she's hooked up with none other than Angel Haze, the Michigan rapper with some serious attitude and undeniable talent. The result: a sumptuous explosion of soulful R&B and honest hear-felt rap lyricism. As Sasha Keable's vocals are growing from strength to strength, so is her fan base and peoples love for her. 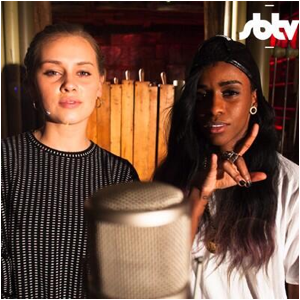 Keeping it no secret - Angel Haze is a fan of Sasha Keable, and thought no better person than Sasha to feature on her single ‘Battle Cry’, for this exclusive A64 - which was brought together by SBTV, for SBTV. Keable who has a signed management deal to Disturbing London, recently inked an impressive 5-album deal with Universal Music subsidiary, Polydor.